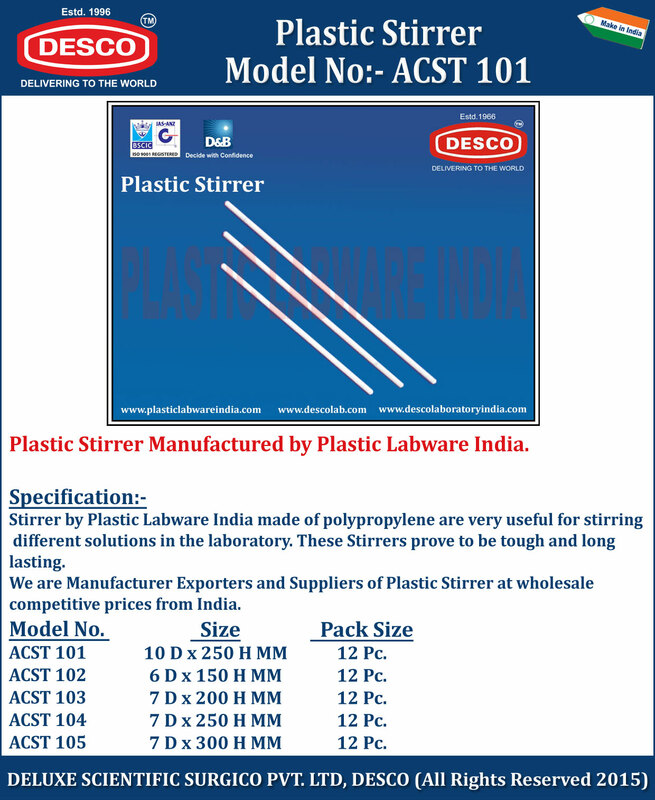 Stirrer by Plastic Labware India made of polypropylene are very useful for stirring different solutions in the laboratory. These Stirrers prove to be tough and long lasting. We are Manufacturer Exporters and Suppliers of Plastic Stirrer at wholesale competitive prices from India. ACST 101 10 D x 250 H MM 12 Pc. ACST 102 6 D x 150 H MM 12 Pc. ACST 103 7 D x 200 H MM 12 Pc. ACST 104 7 D x 250 H MM 12 Pc. ACST 105 7 D x 300 H MM 12 Pc.